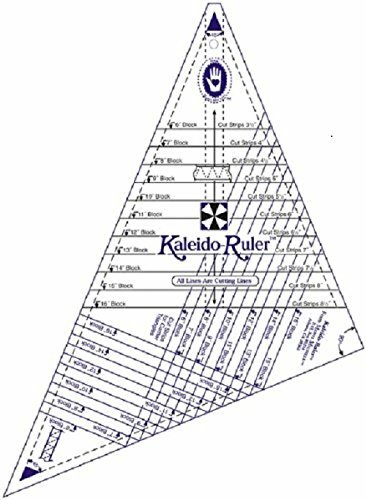 Marti Michell Perfect Patchwork 6-inch to 16-inch Kaleido-Ruler. Use this large ruler for cutting triangles for Kaleidoscope blocks easily and accurately. Marti Michell templates include full size quilt templates of precision laser-cut 1/8-inch acrylic. A 1/4-inch seam allowance is already added; easy to follow purple and black markings. These wonderful tools are perfect for hand or machine piercers. Perfect for rotary cutters to cut multiple layers at once; smart corners so no more dog ears. Template measures 7-3/4-inch by 15-inch. Constructed of clear acrylic. Made in USA. If you have any questions about this product by Marti Michell, contact us by completing and submitting the form below. If you are looking for a specif part number, please include it with your message.